This grant is offered in the context of a groundbreaking funding initiative started by the Ph.D. 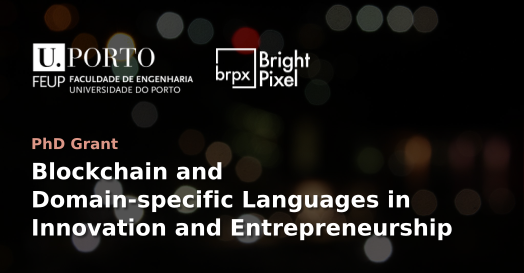 Program in Informatics Engineering (https://dei.fe.up.pt/prodei) in collaboration with some of the leading IT companies in Portugal to support outstanding candidates. Open collaboration has shown to be a key factor to the survival and competitiveness of many industries. However, matchmaking between the needs of big corporations, the solutions that the startups can provide and the knowledge and research in the universities is intricate, and the incentives for the parties involved are misaligned. We think there is space for an automated and decentralized approach to this problem. Distributed Ledger Technologies (DLTs) and smart-contracts can provide interesting solutions for building a merit-based platform, the incentives system, setting the rules of the relationship between parties, providing governance throughout the process, and making everything tamper-proof and transparent. Existing research and practice around Domain-Specific Languages (DSLs) and Model-Driven Engineering (MDE) may help to overcome some of the existing challenges that underlie this topic. The candidate should have a very strong background in informatics engineering or computer science. Demonstrable interest in DLT, Innovation, Domain-Specific Languages or Model-Driven Engineering will be valued.